Tastefully decorated and comfortably furnished, chances are, you will never want to leave! Bathed in soft neutral colors that compliment the Florida landscape, here is your relaxing home away from home. The kitchen is fully stocked with utensils and cookware, including coffeemaker and microwave. A breakfast area seats four and is a perfect spot for casual family dining or playing board games. The living area is spacious with a relaxing sectional couch where you can rest after a wonderful day outside, or perhaps to enjoy a movie night with the large flat screen television with 200 HD channels and DVD. 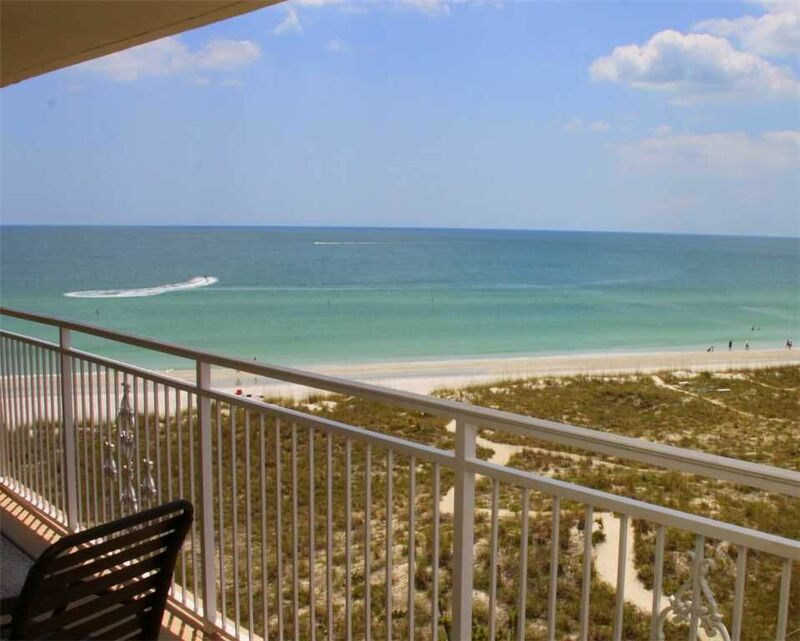 Step outside to the balcony and take in the beach views. The master bedroom is bright and spacious with a king sized bed, television with access to the private balcony. The second guest room offers one queen bed, television and ample closet space. A washer and dryer, WIFI, unlimited local and North American calling and sleeper sofa are also included in this property as are linens, extra towels and pillows. Like all SunHost properties, you will find our vacation rentals meticulous. As a SunHost guest, you will have access to office services, including fax, copy, and printing boarding passes. Seven day a week maintenance service is available as well as an after hours emergency on call person. This is a non smoking home. Guests are not only steps away from the fabulous beach, pool, and BBQ facilities, but also popular John's Pass Village, where you can enjoy shopping, restaurants, and entertainment along a 1,100 pirate themed boardwalk. A quaint turn-of-the-century fishing village and Pinellas County's number 1 tourist attraction. The Village has over one hundred unique shops, a variety of restaurants, the local fishing fleet, dolphin watching and shelling tours, boat rentals, parasailing and jet skiing. Best of all as a SunHost customer you can walk to this great entertainment destination. Anchor tenants include Bubba Gumps, Hooters and Hubbards Marina and also world famous Bamboo Beer Garden. Madeira Beach is a sought after community, just west of St. Petersburg. Its 2.5 mile beach is popular with sun lovers and offers some of the best fishing in the area. This Gulf getaway has something for everyone, including water sports along some of the most beautiful crystal clear waters in the world. The condo is nice but it need curtains because the light at night from John Pass is very annoying and in the morning the sun shine through like you where outside. Beautiful condo with great ocean views. Love the top floor. Great weather and great location.